You know that quote “all good things come to those who wait” and the platitude “everything happens for a reason” which we console ourselves with when faced with crushing disappointment? If you detest them then stop reading NOW because this is the next installment of one of THOSE stories. Laughing, she climbs back into her trusty vehicle and heads downs the road. The GPS tells her she is just minutes away from the home of her hosts for the night. She finds the house and drives once around the block, trying to calm her pounding heart. At the door she is welcomed in with warmth and enthusiasm. Introductions all around, offers to help carry her bags, gifts of thanks placed on a gracious kitchen table. Soon, everyone is chatting more friends catching up than strangers newly met. Time to head for the potluck. They gather chairs and their culinary contributions. She is feeling better about hers since she stopped at a local farm stand and purchased half a dozen beautiful peaches to grill for dessert. This will compensate for the somewhat over baked cornbread she has tucked in the bottom of her grocery tote. Another group member will meet them at the potluck dinner; her dog was taken ill and she is not sure if this will change her plans. Her host family lives just outside historic Saratoga Springs. The town is clearly in full celebration mode for this end of summer weekend. Signs of weddings abound, and she is struck by the thought that just a year ago her own family was in full wedding preparation mode. Then there are the horses, so majestic and spirited! She thinks of meeting Simon, Lulu and Fanny and has to catch her breath. The Anderson’s horse pasture and home sit on top of a hill with a classic view of rolling peaks. 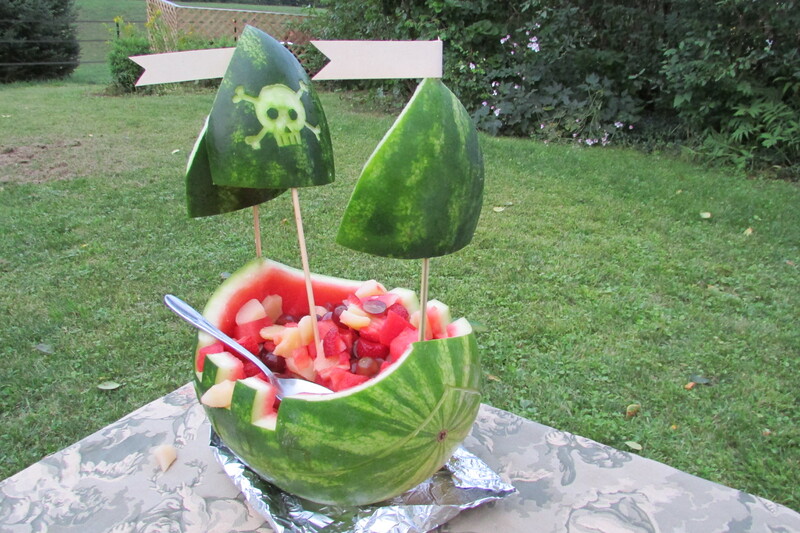 As group members arrive and greet each other with “Oh I love your blog,” “So you are the one who has the goats,” “Oh yes, he is the poet.” A masterful pirate ship carved from a watermelon arrives. Much delicious food is shared, some pirate bling is distributed, many hilarious stories are shared. Although the planned photo walk is cancelled by a rain shower, everyone departs smiling at the promise of meeting again at the Open House. As she rides back with their other guest, (whose dog is doing well under her husband watchful eye at home) their conversation is peppered with “Oh my look at that shot….should we pull over?” As they talk they find so many connections in their past; it is not often she finds someone who has also lived in Hong Kong and knows the Starr Ferry. One spectacular vista almost has them convinced to take the photo op but the roads are very winding, darkness is approaching and their hosts car would be far ahead of them in minutes. “Those are the Adirondacks right?” her new friend says. “Yes,” she responds. “Well, another time” they sigh and drive on. Any other such moment would break her heart, but under the spell of this dreamlike evening, she believes in second chances.